He's no Lance Armstrong, but he's doing his part to put cycling in the spotlight. David Byrne, best known as the Talking Heads' front man, is leaving his artistic mark on New York City one bike rack at a time. Asked by the Department of Transportation to judge a creative bike rack contest, Byrne submitted a few of his own designs. The Byrne originals were installed, and the contest winners will debut in September. 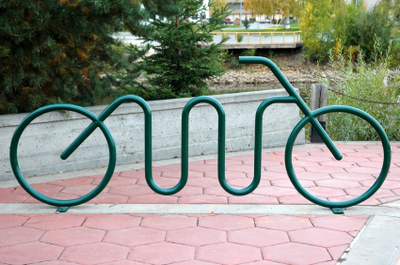 While bike rack art certainly isn't confined to New York City (the image above was snapped in Fairbanks, Alaska) Byrne's high-profile involvement could boost urban cycling's cultural cachet. Janette Sadik-Khan, the city's transportation commissioner, welcomes Byrne's involvement in the contest. "The idea that it's cool to bike really helps," says Sadik-Khan. "The New York City Department of Transportation is not necessarily known for its cool reputation." With Byrne's original designs installed and the contest finalists announced, the Department of Transportation might just develop a reputation for good taste. Are you an urban cyclist? Boost your cool with jewelry made from recycled bicycle parts and get hip to the latest bike fashion trends with tips from Cyclechic.